The future in English is complicated. The problem is that there are so many different ways of talking about it, and the differences between those various ways are sometimes quite slight. 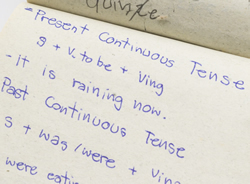 This week and next, we’re looking at the range of tenses and structures that we use to talk about the period of time that is to come. We are having dinner with friends tonight. I’m seeing the dentist tomorrow. I’m starting my course next month. We use this tense for talking about the planned future – things that we have already arranged to do. We use it both in statements and questions, and we use it a lot. It may be useful to think of the present continuous as the ‘diary’ tense – the tense that you use to talk about meetings, appointments, etc. that need arranging – the sort of future events that you might write in your diary. I’m quite tired- I’m going to have an early night tonight. I’m going to call Louisa tonight and see how she’s doing. I think she’s going to speak to Dan about it. What are you going to get for Sophie’s birthday? I think he’ll (= he will) be pleased to see you. I’m sure Sophie will do well in her exams – she’s really clever. I never see anyone in that shop – I bet it will close soon. I’ll probably be home before midnight. It’s going to rain, isn’t it? Look at those clouds. You’re going to fall off that chair! Come on, sit up properly! A: The train takes three hours. B: Does it? In that case I think I’ll drive there. A: I don’t have enough time to go shopping. B: Don’t worry – I’ll do the shopping. Note that the second of these is also an offer. ‘Will’ is used for suddenly making offers that we have not planned. Thank you very much! Pleased you like it. Thank you! I hope you found it useful. Thank you so much for this post! It’s really helpful. Finally I’m starting to understand Future Tenses. That’s great – just what we like to hear! I just want to ask a simple question. He comes late. He(subject) comes(verb) Late(is a subject complement). In my opinion LATE is a subject complement because it tells us about the nature of the Subject. Am I right? Hi, I would say that ‘late’ is an adverb here rather than an adjective – so it is a complement to the verb rather than the subject. ‘come’ as a verb is not usually followed by an adjective, so you cannot say ‘he comes happy’ or ‘the sky comes blue’ (except maybe in poems). Hope that explains it! You really went into details! Thank you. I first read very similar explanation in Grammarway 4 by Jennie Dooley, Express Publishing .I have been using the grammar in my teaching since early 90s, it seems to me. Thank so much.Your writeup is so educative. Couldn’t you explain, please, when the “shall” is used? Thank you. It’s fruitful indeed! More light into the dark corners of thoughts. Thank you, so much. I want to ask a question ” I am happy to see differently photography ” is it right? Okay.. I am happy to see different photographs.. Is it right? Please explain this to me..I am happy to see different photographs.. Is it right? Hi Mili. ‘Different’, the adjective, is correct in your sentence. ‘Differently’ is an adverb, so wouldn’t make sense there. I hope that helps! You made future so ease and clear!!! Hi, could someone please explain when to use “going to…” or “going to go to…”? eg: What are you doing this summer? I’m going to go to France. Thanks Kate! *shaking head* English is just so strange. Thank you very much, Kate, for these explanations. English is full of subtleties that ,sometimes, English speakers as a second language find it difficult to grasp. And please when do I use them?